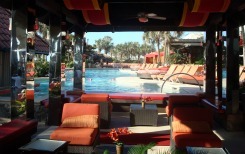 San Luis Hotel Galveston, A Guilt Free Splurge! This Time It all Fell Into Place! A Stay at San Luis Hotel Galveston! We had wanted to stay at the San Luis Hotel Galveston for sometime. But it was always something. You know. ..
Can you remember a time when you really splurged on something? Did you feel guilty afterward - just a little? Ah ha. This time guilt has been vanquished! Hooray! Yes that pesky side effect cannot be found. We are pleased to report No Guilt Feelings for splurging! It has been about two weeks. Not a trace. Staying at the San Luis Hotel Galveston was perfect! From the moment we arrived what a surprise! 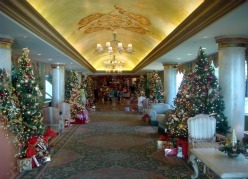 As we walked the Grand Promenade it was decorated for Christmas. It was beautiful. Being from Pittsburgh, it is a pleasure being in the south during the holidays. The warm climate and holiday spirit make us feel we are getting away with something. No, we do not miss the snow! Oh, hats off to the staff! Those folks were so kind and helpful. Their purpose was clear: keep us distraction free. Relax, recharge, enjoy. Our room on the 14th floor. It could not get any better. The setting was warm, romantic, and cozy. The bathroom was on the small side, but Sarah deemed it great. Well then, it was. Often I have bed dread, on vacation. We sleep on an adjustable bed. And we are used to that system. 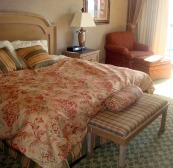 Our bed at the Resort was comfortable. Bed dread vanquished too! I see a pattern starting to emerge here. The view from the balcony? Timeless Galveston Island beauty. No excess overstating the obvious. An absence of things, can be aesthetic. The San Luis Resort achieves this. There were no excess filler type accoutrements to distract. The resort is beautiful and distraction free. restaurant! It is fashionable and attractive. But, it has a casual air about it. How do they do that with mahogany walls and leather chairs? Food was the best we ever had! We both had steak. Sarah had filet Mignon. I, New Your Strip-huge! 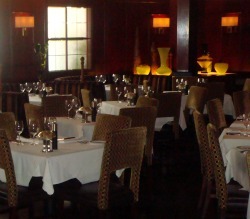 With an ever attentive staff, it was absolutely wonderful. Hopefully this helps in your decision to stay, at least once, at The San Luis Resort Hotel. We are certain, it will not be the last! And you may have the delightful side effect of: No Guilt for Splurging! 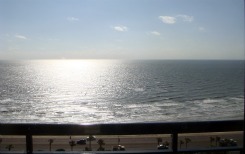 Leave San Luis Hotel Galveston and return to Galveston Travel and Charm Homepage.